Having twins means having a double stroller. In the past year, we have had two different double strollers and now we have a THIRD, thanks to Kolcraft® and Contours®! Why so many strollers?? Well, each stroller is completely different in the function it serves. The first stroller we purchased was a side-by-side umbrella stroller. We knew when we purchased it, it would not be a stroller that we could use immediately, because it did not offer the ability to use with infant carriers. However, it was a "great deal" (from a friend) and we couldn't pass it up. The second stroller was a baby shower gift and was a tandem/front-back stroller that matched our infant carriers and allowed them to pop-in and out of the car straight into the stroller with ease. It was a great concept and we did enjoy the stroller, but as the boys out grew the infant seats, the stroller didn't seem to meet our needs anymore. 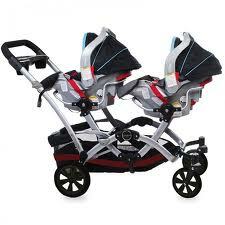 So, in search of the perfect stroller, I came across the Contours® Optima™ tandem stroller. The Contours® Optima™ tandem Stroller offers a new approach to tandem/front-back strollers. It has SIX different seating positions: children can both face parent, face forward, back-to-back, face each other (my favorite) or if only one child is with you, the back seat can be removed altogether and you have extra storage space in the basket below-perfect for shopping. Although it appears to have lots of parts, assembly was a breeze! While we were getting the pieces out of the box, I commented on the super cool fabric on the seats and how comfortable it looked, while my husband commented on how awesome the rear tires were! They are actually pretty great- they are never-flat wheels-but honestly, that's not the first thing I noticed about the stroller!! It's pretty... I see pretty, he sees function! My husband is usually the one who assembles everything, but this time I insisted on putting it together.. and timing it! He read the directions as I pieced it together.. took exactly 10 minutes and was very easy to do. The babies were napping during stroller assembly, but as soon as they woke up, we took them for a spin in the new ride! There is a huge difference in the visibility they have compared to our other tandem/front-back stroller. I always felt bad putting the babies in the other stroller because I felt like the baby in the back seat really couldn't see out and was constantly having to lean around the front seat to see. The Contours® Optima™ tandem Stroller has stadium seating allowing the baby in the back to sit a little higher than the one in the front,which allows them to see out better...and with so many different positioning options, we can reposition the seat to suit them best. OR both turn to see me while I'm pushing the stroller. The seats also recline independently which is very convenient for small babies or for older children who might fall asleep during their stroll. Seats are equipped with 5-point safety harness that are adjustable to accommodate a growing child as well as a padded infant headrest and strap sleeves for added comfort. Additionally, the seats will be able to carry a child up to 40 lbs per seat; 80 lbs total. Definitely a plus when looking for a stroller that will grow with your child. Another feature is the full canopy. The canopies are adjustable in height, can be raised or lowered from 23" to 27", and provides an excellent amount of shade to keep each child covered. 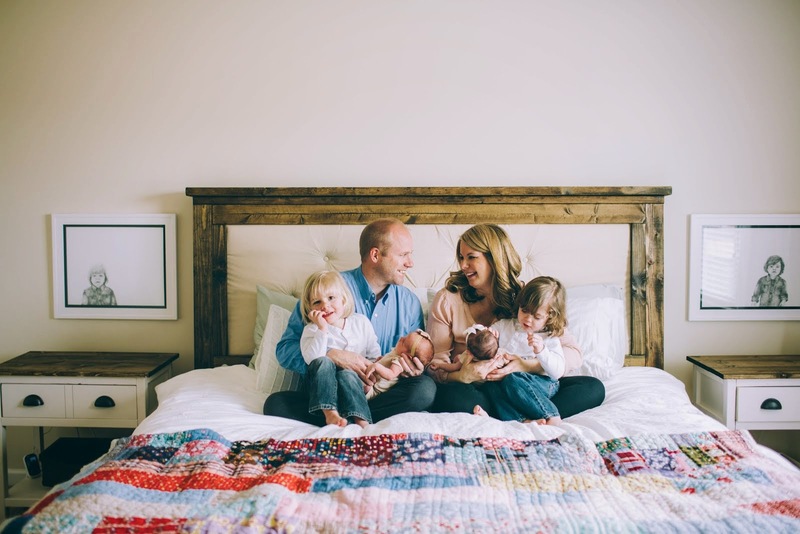 A peek-a-boo window on each canopy allows you to keep an eye on your little ones. The Optima™ also comes 4 cupholders, 2 for kids, 2 for parents! The cupholders are sturdy and are easily removed for cleaning! The cupholders for the kids also pivot for easy access by the child! 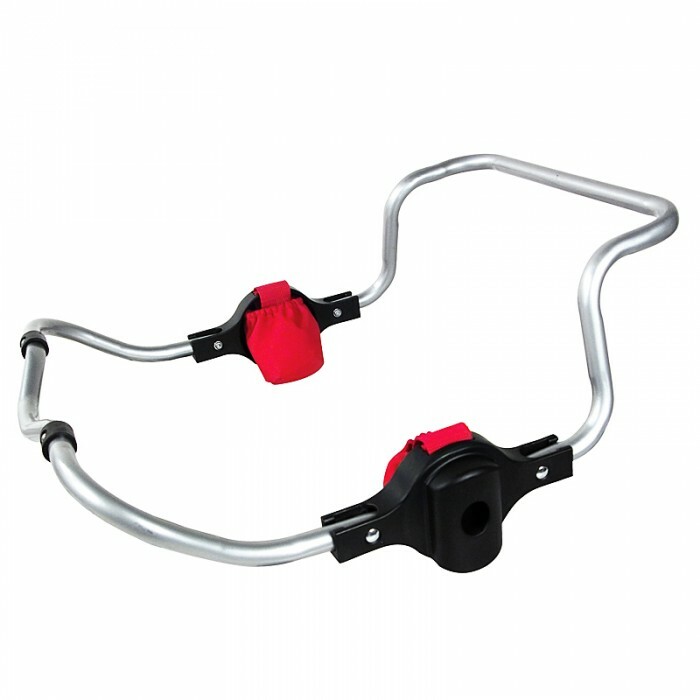 Between the handle of the stroller there are 2 adult cupholders as well as a storage area which is perfect for paci's, keys, phone or other smaller items needed on your outing. There is a LARGE storage bin under the seats. It is the length of the stroller and provides so much space that even my over-sized backpack for the twins fits with ease and there is PLENTY of left over storage space for other items! To fold stroller, it has two red grips/triggers on the handle that you move in an upward motion while stepping down on the back of the basket. The stroller fold quickly and easily. It has a manual latch that keeps the stroller in the folded position. 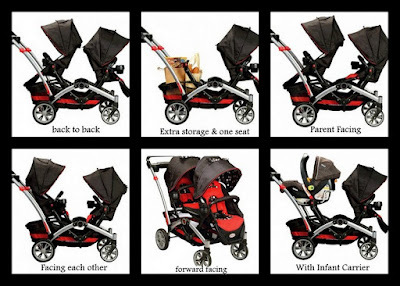 You do have to remove one of the seats for folding but it can rest back in the stroller after its folded to minimize the space it requires to transport/store the stroller. Of the 3 strollers we have, this isn't the easiest stroller to close, but it isn't the hardest either! Convenient Free-Stand™ allows the stroller to stand upright while it is folded and from this position is easier for me to pick-up to put in the car. It is also lightweight, weighing in at only 36.8 lbs. Another really awesome perk of the Optima ... it comes with an Infant Carseat Attachment! Say you don't have twin toddlers but still need a double stroller... one of the bigger seats pops right out and the attachment slides in place. Yes, it is that easy! If you are expecting twins, or have twin infants, another infant attachment can be purchased on Kolcraft's website for only $29.99. Click here for a list of infant seat brands that can be used with the Optima™ Infant Carrier adapter. Safety, comfort and versatility must have been at the forefront of Contours® mind when developing the Optima™ tandem stroller and it shows! Please visit Kolcraft today to purchase your stroller for only $299.99! *This stroller comes with a one-year manufacturer warranty.